It’s a long way from Melbourne to Malta, but for Faculty of Arts alumna turned diplomat Julienne Hince, the small island nation is now home. Currently serving as the High Commissioner to Malta with accreditation to Tunisia, Hince is a career officer with Department of Foreign Affairs and Trade (DFAT) and has held various senior domestic and international posts. 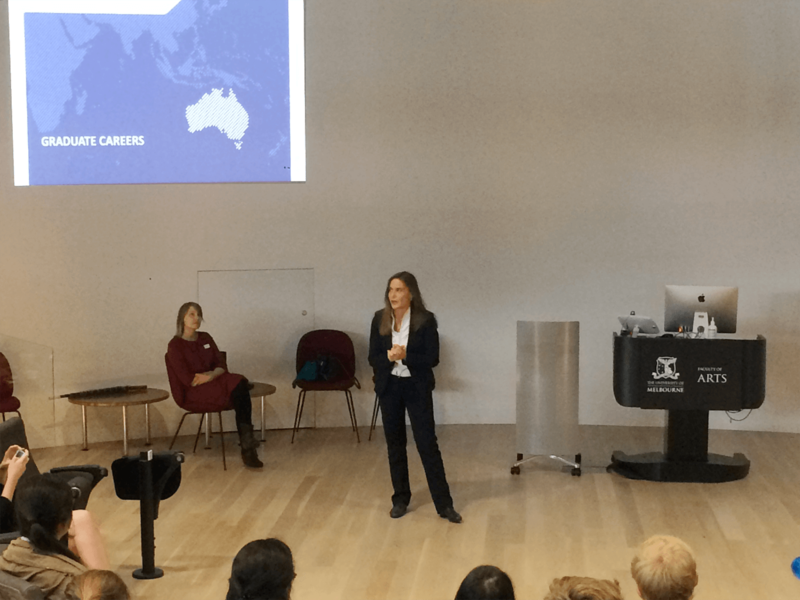 We talked to Hince about what it’s like to work in the foreign service, and her advice for arts students aspiring to work with DFAT. What does your work as the High Commissioner to Malta involve? It’s one of the smaller missions in our network and Malta itself it quite small – about 460,000 people. But Australia’s Maltese diaspora is an important one - numbering about 160,000 people. One of the things I’m talking about with politicians there is seeking Malta’s support for a free trade agreement between Australia and the European Union. 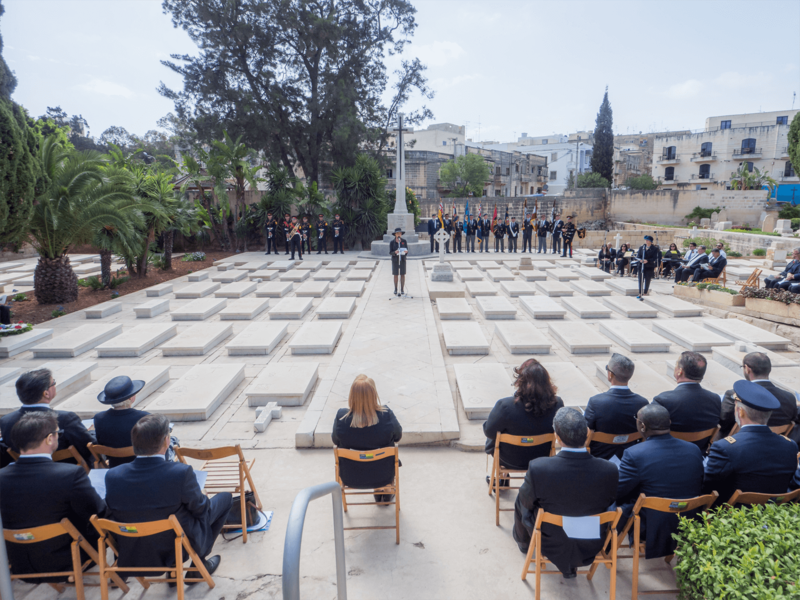 We’re [also] considering things like – what does Brexit mean for a country like Malta, that was a British colony, and what does that mean for our relationship with Malta? 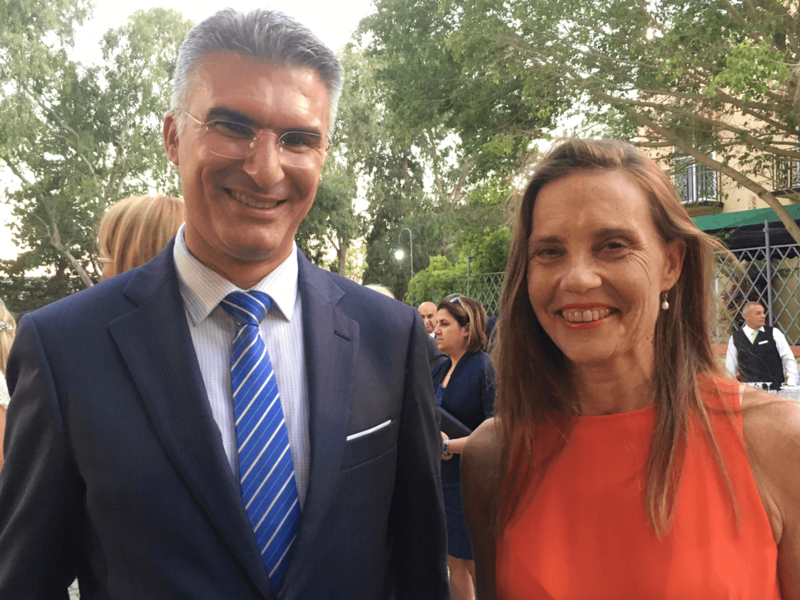 Australian High Commissioner to Malta Julienne Hince with Malta’s Foreign Minister Mr Carmelo Abela. Australia is a candidate for the Human Rights Council in 2018–2020 so all of our missions around the world are doing work to seek their host government’s support for Australia’s candidacy. That’s probably close to our number one foreign policy priority for the year. I’m also accredited to Tunisia. I’m not formally ambassador yet as there’s a diplomatic process meeting the Head of State where letters from the Governor General are handed over. It’s not uncommon for Australian embassies to be responsible for more than one country. We have an ever-increasing network of embassies, over 100, however there are something like 190 countries in the world so many embassies have accreditation for places in addition to where you’re not based. Every embassy around the world has responsibilities for Australians travelling or living abroad. That’s more of the consular side of things. Helping people with passports, helping people because they’ve become sick overseas or have legal issues. That’s a standard set of services we offer to the Australian travelling public. Then there is the more fun side of things like our cultural relations programs. I’m always open to ideas so to anyone reading this: if you’re Maltese Australian or Tunisian, or travelling there, and have an idea for a cultural event, get in touch! 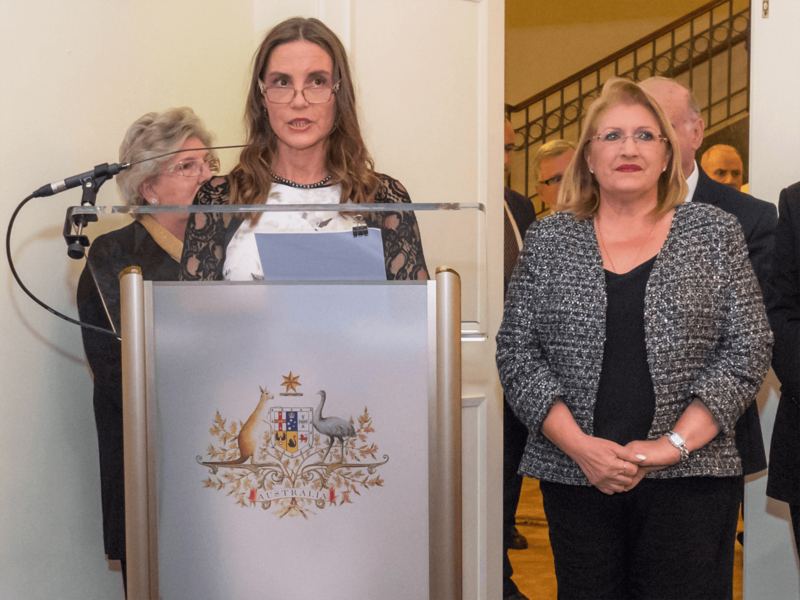 Australian High Commissioner to Malta Julienne Hince with Malta’s President Marie-Louise Coleiro Preca, on Australia Day 2017. What do you enjoy most about your overseas postings? I like people and I still find it exciting when you have an idea of a place you haven’t visited, then you land on the ground and see how your image compares to the reality. I still have that youthful enthusiasm for adventure! The range of things you end up doing is very large. One day I could be meeting the Prime Minister of a country and then the next day I’ll pick up the phone because somebody is sea kayaking from Tunisia to Sicily. 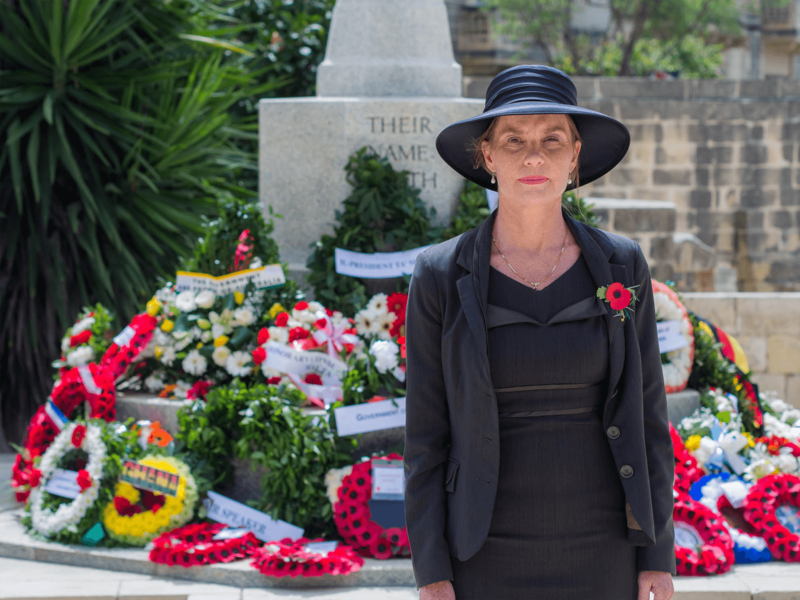 Australian High Commissioner to Malta Julienne Hince at Pieta Military Cemetery in Malta. Anzac Day 2017. Everyone who joins DFAT does so because they are passionate about Australia. It’s a great privilege to be able to learn about your own country and then use that knowledge in your professional life. In what ways did your Bachelor of Arts give you a foundation for your work in diplomacy and international relations? Without a degree from the University of Melbourne I wouldn’t have been able to have the career that I do now. Both on the personal front and for professional purposes I still think that a Bachelor of Arts is a great way to go. Lots of people seem to think that you need a PhD or a Masters for foreign affairs…one thing I’d note is that I have an ordinary BA! We look at a lot of different sources of information: it could be media, politicians, students who are demonstrating. It’s a real art because it requires sifting through an awful lot of sources, being able to analyse what’s happening and then interpreting it in terms of Australian interests. An Arts education equips you for lots of areas of life. The things I’ve found useful in many different professions are the ability to express an idea, the ability to hold up an argument, and the ability to act. Being able to think (is) definitely useful for policy formulation inside government. Many students dream of following in your footsteps and working for DFAT – do you have words of advice for them? Australian High Commissioner to Malta Julienne Hince at the Faculty of Arts, University of Melbourne. It took me quite a while. I was living in the South Pacific teaching English after I finished my degree. Do your research. We want people who are engaged intellectually, who are looking at what Australia does around the world, and who have an eye for strategy. Don’t forget that you’re just a slightly glorified administrator! There is an element of glamour associated with what we do overseas, and I love it, but you have to be able to function in a big bureaucracy. You have to be able to work with other people. What is your proudest professional or personal achievement to date? Being involved with MH17 when it crashed in the Ukraine. I had been sent overseas to help our Warsaw embassy, which had accreditation for the Ukraine. The plane crashed, the ambassador relocated to Kiev and I ran the ship in Warsaw. That was a unique experience. How can you prepare for a commercial aircraft being shot down over a warzone that we couldn’t access? It required a UN resolution to get a free and fair investigation into the causes of the crash. And then there was the whole consular side of things. Over thirty Australian citizens were killed. Being involved in that has a professional pride attached to it. There’s also a little bit of pride that I’ve managed to combine a career in the foreign service with raising four children. Full credit to DFAT on that front too – I think we’re pretty good at accommodating women now. There’s more and more effort going into encouraging women into leadership.